My goal is to make the groundwork and the mounted work so similar that there is very little difference aside from carrying the weight of the rider. 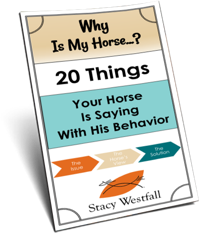 This video begins with a review of the cues I will need when riding a very green colt; bending from the ground, bending while moving, voice cues, dressage whip means go forward and bend to stop. Can you see how Jac is noticeably more relaxed about these exercises than the last time he was videoed? In this video I do a demonstration of half-way mounting both at the stand still and moving. The biggest reason for this is that half mounted is an easier position to dismount from. I demonstrate how it looks when it all goes as hoped. Then I demonstrate how to do an emergency dismount from this position. I like to mount and dismount from both sides, repetitively, to build confidence in the colts, you can see how this has worked with Jac. I also show how I like to hold my reins, whip and saddle during the first rides and I explain why. Can you see how the groundwork and the mounted work are so similar that there is very little difference aside from carrying the weight of the rider? ← Keep horses drinking during freezing weather…and all animals. Good video. I’m wondering if you can give an estimate of time spent with each teaching/communication. Thanks. 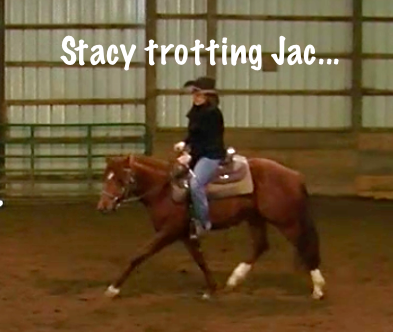 Stacy- do you find you can work on teaching a young horse to be quiet while mounting using a block? I am very short- just 5 ft tall, and while I can get up onto a 16+ hand horse from the ground with quite a bit of me re-positioning to get up, with a green horse, I worry that would be too much strain on the both of us. Using a block is obviously a little more time consuming, but do you think it’s a deal breaker and I should stay away from taller horses? Anna-It depends on your comfort level and you willingness to work. It doesn’t have to be a deal breaker but if it is going to rob you of enjoying the process you could consider shorter horses. The possibilities of training are almost endless. It is possible to teach them to bow or lay down or stretch out to be mounted…creativity and knowing yourself well will help you decide. I was so happy to see this posted!! He is a stunning mover.. I love his big lope. 🙂 I’m excited to see more. Thank you!!! I was so incredibly excited to see you had posted this! He is stunning, big loper! Your training is so thorough, it’s obvious that contributes greatly to his confidence. Thank you for sharing Stacy! This has been so much fun to watch. Thank you. Im not starting a colt but i have a mare that has alot of issues with being saddled girthed and mounted and im gonna start from the beginning and watch all your episodes and maybe make my own video diary and share it with you not like copying you just to watch our progress. Congrats!!!!!!!!!!!! He looks great I am so happy to see you on him. I love your videos thank you so much for putting them up. First ride on a colt. Why no hardhat? 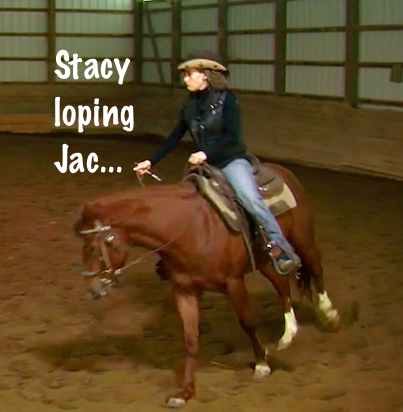 Congrats Stacy and Jac! I always love seeing the first few rides, it makes my heart melt! It’s so rewarding to see the results of all your hard work. I only had another 1 1/2 years with her until colic took her (I didn’t have the money for the surgery and didn’t have insurance). But our first ride made me cry because it was our hard work finally paying off! Now, I’m starting over. This time with a Clydesdale! Everyone asks me “why a Clyde?” Because he is a kind soul that no one wanted because his color isn’t “right” and conformation was off a little. YAY!! You guys look awesome!! This makes my heart happy! I do have a question though, in watching your legs, you bump for most of his forward motion, why is that? 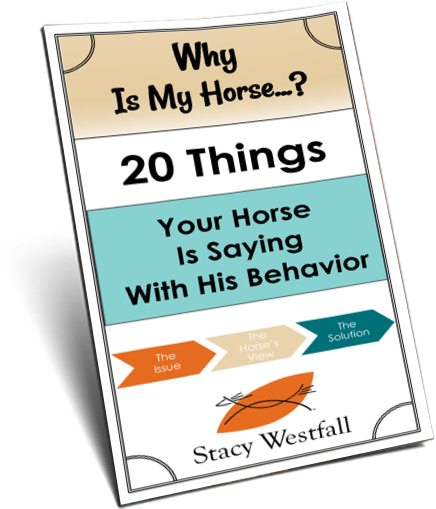 I bump and the horse moves on and I don’t keep bumping unless they’re not picking up the speed I ask or if they’re not moving off. I have a 2 and a half year old that I’ll be starting in another year or so and I am curious! This is great! He looks so relaxed and ready to learn. 🙂 Can’t wait to see what’s next! Thank you so much for patiently and painstakingly, documenting all the details. Very Excited for you both!!! Love the way you have presented this, in way even novice rider can understand!! thank you!!! Been waiting for this day!!! Great job, Stacy! Will be watching to see when y’all arrive in Bowie. That’s only about an hour from here & I know the route well as there is a Pet Cemetery in Bowie where a number of my Chows are buried. They also do cremation & have done maybe 10 or so for me over the years. Its called Pine Hill Pet & Horse Cemetery & Crematory & is such a beautiful, peaceful place. I would soooooo love to meet you & your family as well as Jac & Popcorn! Unfortunately I am without sound on my computer. What do you do if they offer to buck the first time you ask for the lope? Very soft and quiet. Great job for you and Jac. Love it. Not able to watch the video. Getting an error occurred message. : (.